A citrus tree with greening, foreground, is seen. A disease affecting the citrus industry in the Rio Grande Valley has now spread to Starr County. 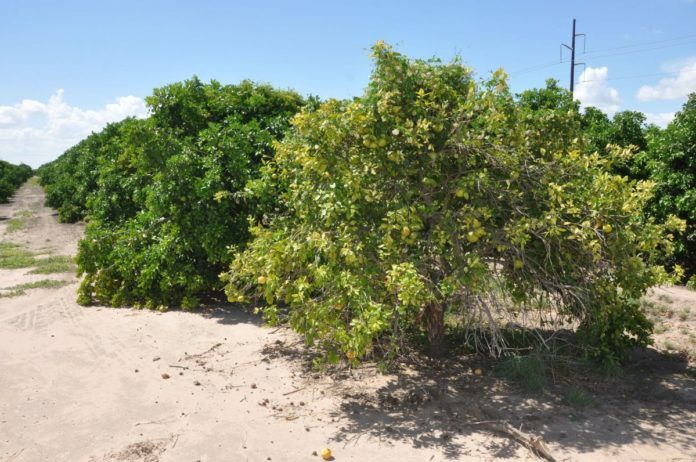 Last week, the U.S. Department of Agriculture expanded the quarantine area for citrus greening to include Starr County. The quarantine already includes Hidalgo, Cameron and Willacy counties. The USDA Animal and Plant Health Inspection Service — in conjunction with the Texas Department of Agriculture and the Texas citrus industry — moved to expand the quarantine area after detecting citrus greening in plant tissue samples from the area. “This action is necessary to prevent the spread of citrus greening to non-infested areas of the United States,” APHIS officials stated in a news release. The USDA surveys both commercial groves and residential properties with citrus trees for the greening disease on an annual basis, Abbey Powell, public affairs specialist for APHIS, stated in an email. In Starr County, 27 instances of the disease have been found in trees on residential properties, Powell said. The citrus greening disease, or huanglongbing, is not a threat to human health, but it does affect citrus production. Citrus trees infected with the disease typically decline in output within five to 12 years, while healthy trees tend to be productive for more than 50 years. Parts of the Valley have been quarantined since at least 2012, when areas near San Juan were quarantined. The following year, an area near Mission was quarantined. Then, in 2014, the quarantine expanded to include all of Hidalgo and Cameron counties. Last month, U.S. Rep. Henry Cuellar, D-Laredo, announced $120 million in federal funds had been secured to combat diseases that affect the citrus industry. For citrus greening specifically, $65 million was secured for citrus health programs and the Huanglongbing Multi-Agency Coordination Group operated through APHIS, according to a news release. “I am working hard to ensure that these funds are directed to citrus growers who need them most, like those in Starr County and the Rio Grande Valley,” Cuellar stated. To help stop the spread, APHIS urges the public to not move citrus trees from their property, Powell stated. Fruit may be moved, but it must be free from leaves or stems. More information about diseases affecting the citrus industry can be found on the APHIS website at saveourcitrus.org.